The handloader can still do things the factories can't. This is what it's all about--great ammunition at the right price. This is a hobby that pays its way as well. Now to the range. A bunch of water has passed under my bridge since I loaded my first round of ammo. Fresh out of the Submarine Service and back in school trying to get my accounting degree, it didn't take long to find out that A) factory ammo was expensive, and B) we had a big walk-in closet that was empty for the most part. Over a weekend, Cindy and I built a rough-looking bench that we attached to the wall with a long florescent light over it. With a new handloading set from Lee, I was off to the races. That old handloading set is long gone, of course. Hobbies being what they are, I passed through a bunch of stuff along this path. My goal was building better ammo faster, and it is impossible to estimate how many rounds I've loaded, nor can I remember all the equipment I've used. Before we get started talking about reloading, it's necessary to point out that our ammunition companies are doing a great job. These days it's downright difficult to build better ammunition at home. Still, there are good reasons to stuff your own. Starting at the top of the list, reloading ammunition is fun, and it's a great way to spend the time you can't be shooting, hunting or fishing. Reloads still tend to be less costly than factory fodder, but when you factor in the necessary equipment, well, you see where I'm going here. If you're working with a wildcat round that no factory loads, reloading is the only answer. In addition, building your own ammunition provides an avenue to come up with a load for a specific job. If you need a snake load for a .45 Colt, for instance, you'll be building 'em yourself. Sometimes an outfit needs just a touch of something to shoot well, and often a good reload is all that's necessary. Reusing cartridge cases (brass from now on) isn't rocket science. It's possible to build very good ammunition after studying a few modern, up-to-date reloading manuals. 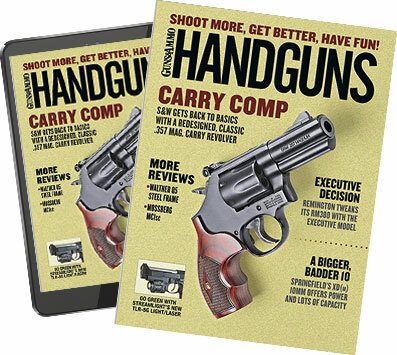 Published by many companies and available at your local sporting goods store, these reloading manuals are indeed the bible of reloading. Many include a glossary of terms and definitions of the stuff we use in our trade. It would be wise to purchase and study several before getting your feet wet. Converting a spent cartridge to a fresh round of ammunition begins when you start picking up brass. Competitive shooters, for instance, are often seen scrambling around picking up empties after a match. They aren't cleaning the range; they're picking up the basic package that will end up as a loaded round for the next match. Regardless of the means, it's wise to somehow collect several hundred rounds of brass before you get started. The long-range plan should revolve around loading hundreds if not thousands of rounds. As the number of rounds goes up, the cost per round goes down. The author has been reloading for decades. Most who begin reloading find that they can shoot far more than when they merely bought factory ammunition. With a supply of brass in hand, the next order of business consists of cleaning the cases somehow. Several companies catalog inexpensive case tumblers and polishing media designed for this work. In use, you dump the empty cases and media into the tumbler, turn it on and walk away for a few hours. Presto--fired cases that look like new. From there it's time to carefully examine each case to make sure it's fit for use. Look for cracks or flaws or other visible signs that suggest potential trouble. Brass is cheap; don't get cheaper. Throw away any case that doesn't meet muster. This is also a great time to check the cases for overall length. If they are too long, they should make a trip through a case trimmer where they are shortened to SAAMI specs. Correct trim-to length measurements for each cartridge are listed in those new reloading manuals you've got on the bench. Case trimming can be done by hand, but I make quick work of the job with a vintage Lyman electric case trimmer. Converting empties into loaded rounds takes some basic equipment. There's still the old Lee hand equipment complete with a dipper for the powder, but loading several hundred rounds in this manner would get tedious, for lack of better words. For serious loading you'll need at least a set of dies for the cartridge in question and a machine that will accompany them as well as a shell holder for the cartridge in question. The dies are nothing more than machined-steel tools that screw into or otherwise engage the reloading machine. Dies are purchased for the cartridge and the reloading machine at the same time. They are used to resize and deprime the case and then seat the new bullet. Generally speaking, reloading a bottlenecked cartridge requires at least a two-die set while straight-walled cartridges require three or more. The die set will always include a resizing die that usually deprimes the case at the same time. Resizing dies for bottlenecked cartridges resize the entire case or some portion thereof and deprime the case in one fell swoop as the case is forced into the die. If you're loading for a semiauto or several rigs chambered for the same round, you'll most likely full-length-resize the case. In this process, the case is resized down to the web at the base of the case. Typically, the resizing die is installed to lightly engage the case holder in the ram of the reloading machine at the top of the ram's travel. Working brass extensively takes a toll on case life, and brass that is full-length-resized won't often be associated with gilt-edged accuracy. When maximum accuracy and case life are concerned, and bottlenecked cartridges are being loaded, serious reloaders most often only resize some portion of the case neck. While a neck-sizing die looks like any other resizing die, the die only engages and resizes the case neck. Since the die can be adjusted up or down in the reloading machine, the operator determines the degree of sizing. Neck sizing bottlenecked cartridges works the brass the least and ensures that the case will most closely fit the chamber in which it was fired in the first place. If you're picking up cases on a commercial range or otherwise getting your hands on cases fired in someone else's chamber, you'll have to full-length-size the case first. Once it has been fired in your chamber, you can switch to a neck-size die. Still, since brass flows or expands upon firing, you'll find it impossible to chamber a reloaded case after it's been neck-sized a few times. Then it's time to full-length-resize and trim the case back to the original length. More on that later. Primer pockets must be cleaned prior to loading. Author Johnston uses the RCBS Casemaster to perform this work. The multiple-station machine automates other case-maintenance chores such as case-neck deburring and inside-case-neck cleaning. With the resizing/depriming die properly installed and cases inspected, it's time to begin work. I like to arrange clean, inspected cases into a reloading block that will hold at least 100 cases at a time. With the cases installed in the block, neck up, I give them a light coat of spray lubricant prior to the first step. If you don't lubricate bottlenecked cases lightly, the first case will stick in the resizing die while the shell holder pulls the rim off the case rather than pulling the case out. Then you'll have to use a stuck-case-removing set to pull out the stuck case. Use a good lube, but use it sparingly. Dents in the shoulders indicate too much lubricant. While a lightly dented case can still be loaded, the goal is cases that look like new. With the cases lightly lubricated, I resize/deprime the cases in one step. Once the cases are resized and deprimed it's time to remove the lubricant, inspect them once more and clean the primer pocket since the primer was still in the case when it was tumbled. I use the great multipurpose RCBS Case Master to clean the primer pockets and deburr the case necks after trimming. Once the cases are resized, deprimed and prepared, it's time to seat fresh primers. I again like to arrange prepared cases in a 100-round reloading block. There are several ways to prime a case; you can do it by hand or by machine. I use an older RCBS priming tool that holds the case with the same shell holder used in the reloading press. In addition, this RCBS priming tool has a primer magazine that loads the priming arm with a primer on each stroke of the handle. The primer magazine is loaded by hand out of a primer tray that also can be used to align the primers for use. I've never considered reloading ammunition a dangerous pastime, but primers are explosive by their very nature, and entire primer tubes have been launched through a ceiling a time or two. Keep everything clean and dust-free and handle primers like the explosive devices they are, and you'll get along fine. This might be a wise place to suggest the use of safety glasses while you're reloading, too. Since we're still loading bottlenecked cases here, and they're often associated with gilt-edged, long-range accuracy, I like to weigh individual powder charges. I throw a slightly underweight charge from my old Ohaus powder measure and then bring up each charge to final weight on a balance-beam powder scale. I use an electric VibraShine powder dribbler to bring the scale to zero, but a hand-operated powder trickler works just fine. A plastic funnel placed over each case neck makes charging the cases kid's play, but you've got to pay attention just the same. It's wise to set up a pattern and stick to it. I charge a case and then move the funnel to the next case before starting the next weighing process. When you're selecting a load, it's wise to pick a load that calls for the case to be very nearly filled by the powder charge. Using a case-full powder charge makes it impossible to double charge a case by mistake, and it allows the powder to be seen by the naked eye prior to seating a bullet. When I've charged all 100 cases in the block, I carefully arrange a light so I can verify that each case is loaded prior to the final step. With charged cases ready to go, it's time to remove the resizing die from the machine and replace it with the bullet-seating die. In this process the charged case is moved upward into the die with a bullet on top of the case. The die aligns the bullet and then forces the bullet into the slightly undersized case neck. If the die is adjusted fully down into the machine, the case neck will be crimped into the bullet in the seating die. It's been years since I crimped a bottlenecked case on a bullet, but it's wise to use a light crimp on loads destined for the hunting field. If you're working with a semiauto that tends to be rough on loaded rounds, some degree of crimp is mandatory. If you're crimping rounds, the seating die can be adjusted downward until the case or neck walls are wrinkled slightly. Back out the die 1/4 to 1/2 of a turn, and you're ready to go. Once loaded, the fresh loads are moved into an MTM plastic ammo case. I use a tape writing system to make note of the cartridge, date, case data, primer, powder and charge weight and bullet kind. It's also a good idea to catalog and sort cases by number of times fired. Sooner or later you'll be throwing out these cases and starting fresh. The Lyman power Case Trimmer chuck is of the quick-release type that is easy and fast. Such tools turn what used to be time-consuming chores into pleasurable tasks. With the basics out of the way, we'll look at a few other operations that might be involved with bottlenecked cartridges and long-range shooting. In addition to cleaning and trimming to length, many serious shooters take the time to ensure that the case neck is the same thickness around its circumference to align the bullet as closely as possible with the bore once it's chambered. While some systems remove brass from the inside of the neck, these do nothing to ensure a uniform thickness. To control overall thickness of the neck, it's necessary to remove brass from the outside of the neck as the round is turned on a smooth steel mandrel. Typically, the outside turning tool is adjusted with a feeler gauge. Most often it's only necessary to true up the neck, and often you'll only see half or two-thirds of the neck get worked. If you're working with a tight, custom chamber, you may turn the necks down further. My custom 6mm BR XP 100 sports a chamber neck that measures .260 inch, so my case necks have to be turned to .008 inch (.243 + .008 + .008 = .259 inch). You can see that I leave .001 inch so the loaded round can be chambered. Again, it's possible to turn necks by hand, but I've got a small Jet lathe in the shop and have jerryrigged a system so the cases can be chucked into the spindle for turning. This system eats a few cases during the process, but it beats blisters just the same. Another variable that handloaders can play with is overall length of the loaded round. Rather than loading to SAAMI specifications, it's possible to load the bullet closer to the lands to reduce the bullet jump. It's even possible to reduce the powder charge slightly and load the bullet so it engages the lands as the round is chambered. When you're messing around here, reduce your powder charge by 10 percent, and work your way back up carefully. Bottleneck cases must be lubed before resizing. Most reloading-component manufacturers make a quality case lube such as this lube by Dillon. It's possible to determine the maximum length of your loaded rounds by making up a few dummy rounds with bullets left "long" to be fully seated when the dummy round is run into the chamber of the intended firearm. You'll see slight marks on the ogive where the bullet engaged the lands. These dummy rounds will subsequently indicate your maximum loaded case length. It's a good idea to catalog these and keep 'em around for the next reloading session. The dummy round is used to set the bullet-seating die in the reloading machine. In practice, the bullet-seating die and the seating stem are backed outward so a loaded round can be fully extended on the machine's ram without engaging the die in any way. With the loaded dummy round at the top of the ram's stroke, the seating die is screwed down until it contacts the case neck. Then the locking ring is tightened. Once the die is locked into position, the seating stem can be screwed downward until it contacts the bullet in the dummy round. Lock this baby into place, and start loading. Each subsequent round will be loaded to the length set previously. While this may sound complicated, you'll find that you quickly pick up the basics and are able to turn out very good ammunition in the process. You'll find that you're able to shoot more for less, and you'll probably shoot better, too. In addition, I'll wager that you'll remember the first whitetail buck you knocked down with one of your handloads for the rest of your life; I do. Next issue I'll look at loading the straight-walled cartridges and will talk about three-die sets, tungsten carbide dies and quality vs. quantity loading.